I'm sure everyone in the Northern Hemisphere is looking forward to spring, but here in Australia we're still right in the middle of summer and I'm not ready to give it up yet! It's my favourite time of year and this current summer is actually my third in a row since I made a point of skipping winter entirely last year - if only I could do that every year. In honour of this, I thought I'd put together some of my favourite products for the warmer weather. First up is the Mecca Cosmetica To Save Face SPF30 which I actually first tried when I stayed at Tenneil's in December (she now lives with one of my best friends in Melbourne) and I immediately loved it. It's super lightweight, sinks in quickly, doesn't interfere with your makeup and it contains hyaluronic acid and pomegranate extract (an antioxidant) so although it's more expensive than your standard SPF it's clearly marketed as a daily skincare product, not just something you slap on when you're heading to the beach. I think it's really important to wear a broad-spectrum SPF daily because not only does it protect you from cancer-causing UVB rays but it also blocks UVA rays which, amongst other things, break down collagen in your skin, causing wrinkles and premature aging - not fun! As a girl with oily skin, the warmer the weather gets the more I have to rely on products like primer and powder to keep my face from looking like an oil-slick. I love the Guerlain Meteorites Perles Perfecting Primer which glides on like a serum and is a wonderful illuminating primer without any hint of shimmer. Plus it's absolutely stunning to look at. I also love the good old Rimmel Stay Matte Pressed Powder which I mentioned in my 2014 favourites because it's super affordable and really delivers in terms of oil-control without making you look cakey or flat. I'm sure part of the reason it's so affordable is because of the below-average packaging, but I for one would happily pay a little more if they were to repackage it in a compact with a mirror so it'd be easier to take out in my handbag. For blush I absolutely love the Josie Maran Coconut Watercolour Cheek Gelees. They're a beautiful, lightweight sheer formula that's so easy to use and blend in, they're practically foolproof. I adore this bright orange shade (Coral Oasis) and I definitely have my eye on Poppy Paradise next. On super hot days if I'm not wearing a lot of makeup, eyeshadow crayons are a really easy way to make it look like you've put in more effort than you actually have. I picked up this Stila Smudge Crayon in Kitten while I was in the States and it's beautiful all over the lid or as an inner corner highlight. Surprise! 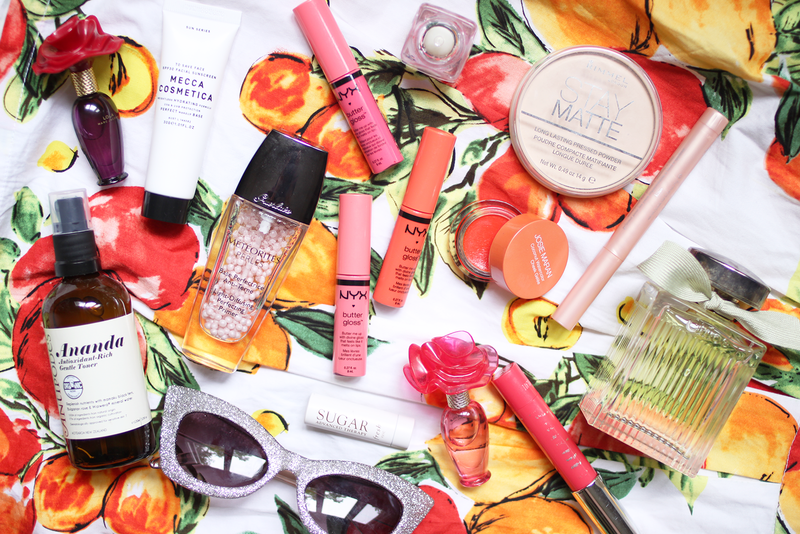 No red lipsticks here, certainly not because I don't wear them in summer but just because every now and then it's fun to switch it up and wear corals, oranges and pinks. You really can't go past the NYX Butter Glosses for a fuss free, non-sticky lipgloss and they come in a huge range of shades and the formula is completely spot on. If you don't have any of these yet I don't know where you've been but I urge you to give them a try. I was actually surprised by how much I like this L'Oreal Glossy Balm in Innocent Coral. I picked it up in New York during the US summer last year and I really feel like I don't have any other shades like this, it's a beautiful perfect coral shade that just screams summer. And for lip balms I've got the Fresh Sugar Advanced Therapy Lip Treatment and the Softlips Cube lip balm because both of these have a slight tingly feeling on the lips which I find really nice and fresh, and they both smell amazing too.